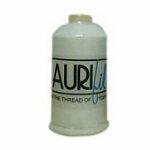 Invisible thread with zero thread breakage and a smooth finish. Shiny, but not reflective. Great for stitchintheditch work, curved crosshatching and scallop border, machine applique and quilting. 100 Nylon. Made in Italy.